Charlotte Strick is a principal at the multidisciplinary graphic design firm, Strick&Williams, founded in 2014 with her longtime friend and colleague, Claire Williams Martinez. The studio collaborates with cultural institutions and clients in the arts, publishing, education, non-profits and everything in-between. For 14 years prior, Strick was a designer turned art director at Farrar, Straus & Giroux, where she designed book covers for much-loved authors like Jonathan Franzen, Roberto Bolaño, and Lydia Davis. Her work has been featured in the AIGA 50 Books / 50 Covers show, the TDC Annual Exhibition, Print Magazine, and in many books about cover design. The proud owner of a coveted Silver Cube from The Art Directors Club, Charlotte is also Art Editor of the distinguished literary magazine, “The Paris Review”. Well, I was born in Manhattan, but when I was seven years old, we moved an hour outside of the city, to a coastal town in Connecticut. My parents were quickly absorbed into the welcoming local artist community, and I (mostly) enjoyed growing up with plenty of green grass, sleepy streets for bike riding, and living not too far from the beach. But I always vowed to return to the grittier sidewalks of my early childhood—and so I did. Does your city and surroundings influence you as a creative and individual? I think it’s nearly impossible not to feed off the rhythms of any city. As New Yorkers of all stripes, we’re routinely forced out of our comfort zones here. The mash-up of ‘high and low’ art and architecture, the overlapping languages, street music, traffic noise, surprising hairdos and inspired outfits . . . Everything is constantly on parade! I try my best to be always on the lookout and soak it all up. What do you struggle with the most in terms of working and living in a city like New York? Well, it’s demanding in most ways, there’s no doubt about that. The air around us is charged and that makes an especially addictive place to live as a creative person; it serves up surprises, daily. The responsibility of the council in every city is to provide a solid foundation of design, art and cultural facilities, is that evident in New York? New York has some of the best and likely least-known cultural resources in the world. As a student and young designer, I leaned heavily on the AIGA (American Institute of Graphic Design) and the Type Directors Club. My first instructor at Parsons School of Design actually made becoming a member of the AIGA (and a subscriber of The New York Times) a prerequisite of her class! The exposure to the established design community served us well; it was a great entry-point. Do you think it is also the responsibility of the designer / creative to improve the quality of peoples lives in their city? Most definitely! Our studio, Strick&Williams, has collaborated with many cultural institutions in our city—including Columbia University, Lincoln Center, MoMA, the French Institute Alliance Française, as well as the nonprofit organization Human Rights Watch, which improves the lives of people the world over and right here at home, too. Designing and strategizing for mission-driven organizations is the work we find most gratifying. We enjoy taking part in the ongoing dialog that makes New York City a thrilling place to work and call home. What is the one thing you can’t live without in New York? One thing? How about three: great food on every corner, subway fashion, and street art. Describe the perfect day for you in New York. A truly perfect day in NYC would require some magic powers that allow us all to move from place to place in the blink of the eye, avoiding the predictable hassles of public transportation. So, with a wave of my brush, it’s a glorious day in mid September. I take a morning walk on The High Line and a quiet hour to myself with a good book on a sunny bench overlooking the Hudson River. Next it’s a visit to the nearby Whitney Museum, which is unexpectedly closed for a private tour of a new exhibition for just my friends and me. We dine at the museum’s cafe and then ride bikes over the Brooklyn Bridge. My husband and kids appear for a spin on Jane’s Carousel in DUMBO, and then the four of us play a brilliant game of Frisbee on the lawn looking out at the East River and get caught in a sun shower. A ferry trip returns my family to Williamsburg where we enjoy a pot of tea and home baked cakes in the garden of Bakeri. On my own once again, I do some window-shopping and journey to Sprout Home to admire the plants and smell the flowers. It would be lovely to meet a good pal or a future client for cocktail hour outdoors at Hotel Delmano or sip a glass of wine at the ever-bustling counter at Lilia. My husband surprises me with tickets for movie + dinner at Nitehawk theatre, and we still make it home in time for goodnight hugs and kisses from our boys—and lights out! If you could add or change something about New York, what would that be? That’s easy—make it more affordable for everyone. Can you tell us about any current or future projects that you are particularly excited about? 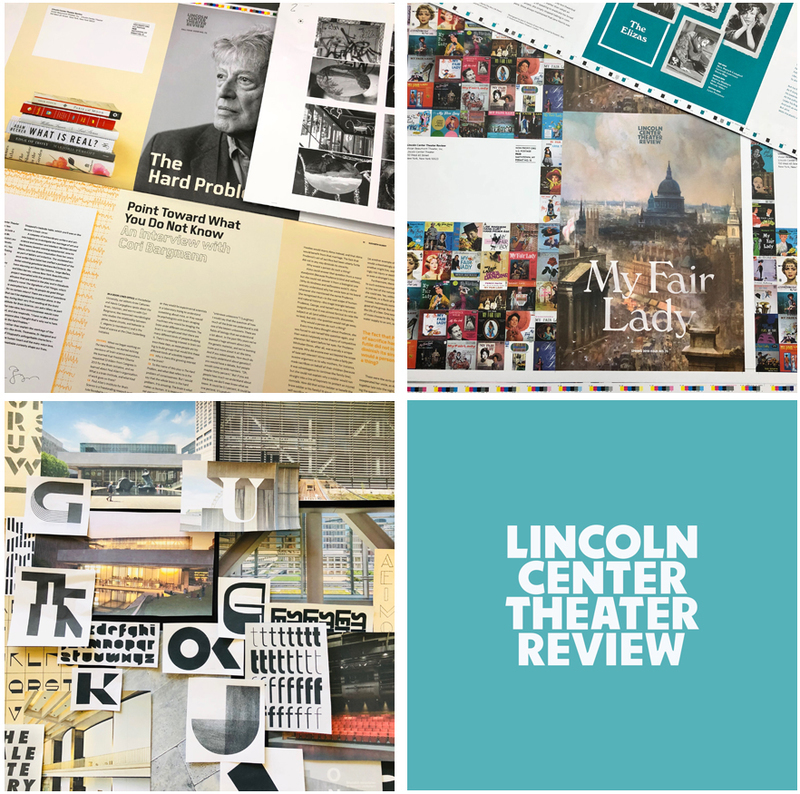 The Lincoln Center Theater Review magazine, now in its 25th year, sets the stage for longer conversations about particular LCT productions, by inviting writers and thinkers to consider the issues and ideas generated by chosen plays. Each issue also features works of fine art that support the writing. Our studio recently redesigned the logo and publication from cover-to-cover. We love to immerse ourselves in the research phase of a project, seeking out what individualizes each new client. With LCTR we dove into the history of the Lincoln Center complex. Renowned architect, Eero Saarinen, completed his design for the theater building in 1965, and it received an inspired addition in 2012 of an additional theater space for emerging playwrights, that sits atop the mid century building. The merging of the building materials, textures, and architectural voices was highly inspirational to us as we thought about the rebrand. Considering the “bones” of the theater helped us to think more deeply about LCTR’s past and present and how best make this publication sing. 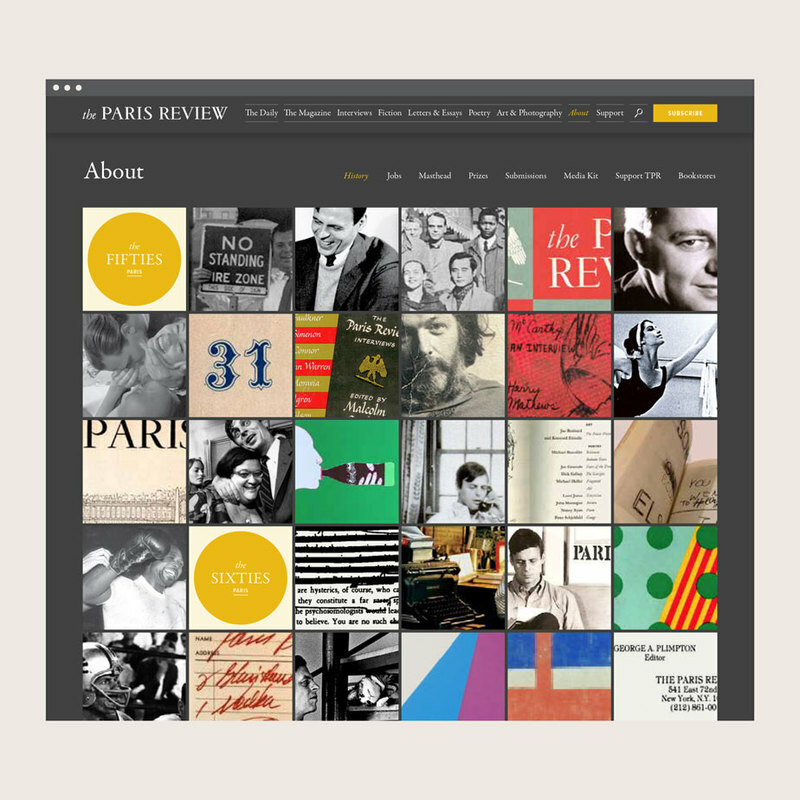 In 2017, our work on The Paris Review magazine and website brought us an exciting commission from the Paul Mellon Centre in the UK. They were seeking a design partner create “A Chronicle, 1769-2018,” a website that celebrates 250 Years of the Royal Academy’s famed Summer Exhibitions. We developed century-specific typography and info graphics that give the user the sense of travelling by time machine as they explore the decades. The site will remain a digital time capsule for the RA, art history students, and scholars. We so enjoyed this collaboration with our clients across ‘the pond’. And in early 2019, please be on the lookout for Chloe Aridjis’s mesmerizing new novel, “Sea Monsters.” I pulled out my paintbrushes and ink for the design of this book jacket, and we’re thrilled that the publisher and author were game for our bold and unexpected poster-like treatment. Sometimes people relate a specific smell to the city they live in or the place they grew up, does New York evoke a personal smell to you? When I was little, and we still lived in Manhattan, my father would often buy me a hot, salty, soft pretzel from a food cart, and the two of us watch the street performers (and sometimes feed a hungry pigeon) from a sunbaked spot on the massive stone steps of the Metropolitan Museum of Art. The smell of those carts takes me right back to the warmth of those afternoons with my dad. Reading book after book to my twin boys at bedtime and watching them drift off to sleep. If you weren’t living in New York and could choose any city to live in where would that be, and why? Outside of The States, perhaps Amsterdam . . . I’ve only been there once, years ago now, but my husband and I haven’t forgotten how at home we felt. We loved how accessible everything was—and also how inspired the architecture choices were—both old and new. There seemed to be a fascinating museum on every single block! It’s no secret that the Dutch are masters of design, and it showed. Brendan Fernandes is an internationally recognized artist working at the intersection of dance and visual arts. Currently based out of Chicago, Brendan’s projects address issues of race, queer cultural, migration, protest and other forms of collective movement. Always looking to create new spaces and new forms of agency, Brendan’s projects take on hybrid forms: part Ballet, part queer dancer floor, part political protest...always rooted in collaboration and fostering solidarity. Carolin Wanitzek is an independent artist, scenographer and set designer based in Mannheim/Germany specialising in handcrafted illustrations, window displays and stop-motion props. She designs three-dimensional installations using a variety of materials. Working in the field of scenography she blends graphic design, set design and photography to develop concepts for extraordinary worlds. Her work has been published in digital media, magazines and catalogues. Currently she is working for national and international clients, such as Hewlett-Packard, Vodafone, Spiegel Verlag and the BASF and she is a partner at OUI R Creative Studio. Amber Vittoria is an illustrator focusing on femininity and the female form, leveraging physical traits such as body hair, overtly extended limbs, and rounded features. Her work has been recognized by Print Magazine‘s 2017 New Visual Artists – 15 Under 30, It’s Nice That, Computer Arts, HuffPost, Teen Vogue, Man Repeller, and 20×200. She has collaborated with brands, such as Gucci, The New York Times, and Instagram. Sydney based Artist & Designer Kris Andrew Small’s idiosyncratic collection of work ranges from lucid abstract pieces & photo-based collages, to fervent textural pieces and kinetic type based works. Kris’ work is often reminiscent of the colour and flamboyance of his childhood, growing up in the 90s in a tropical part of Australia. These early influences are clear across Kris’ portfolio and help to connect the dots and to define his energetic aesthetic. Ethan Caflisch is an Oakland based artist whose practice encompasses painting, sculpture, photography, art direction and design. Across all disciplines, his work explores the beauty of raw materials and is personified by bold linear and organic forms, interspersed by a graphic use of color. His arts education began at the California College of the Arts, where he graduated with an Individualized Bachelor of Fine Arts and a Visual Studies Minor in 2015. His work has been exhibited in many esteemed institutions such as Petzel Gallery in New York, Hubbell Street Galleries in San Francisco, and the Oakland Museum of California.